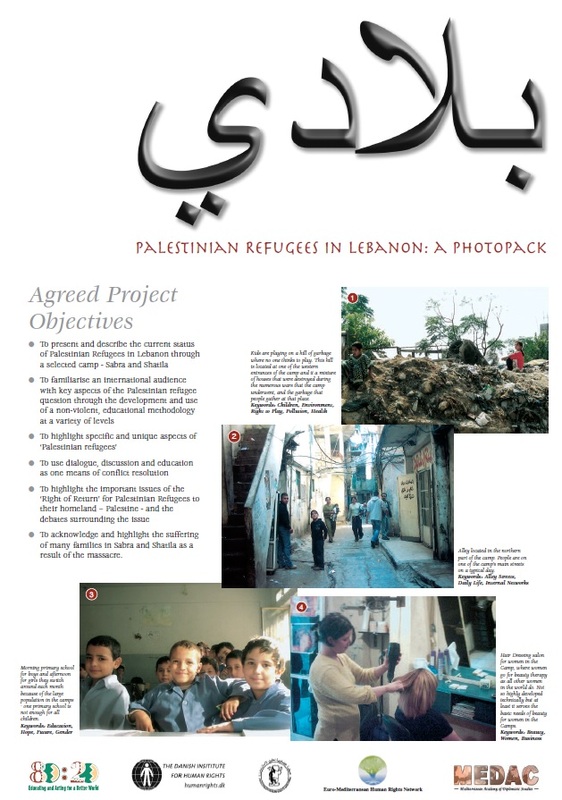 This photopack uses photographs, facts, two case studies and a human rights education approach to understanding the situation of Palestinian refugees in Lebanon living in two refugee camps, Sabra and Shatila. the issue of the right to return to Palestine. The situation of the Palestinian people and the denial of most of their fundamental human rights are well highlighted internationally. Less so the situation of Palestinian refugees and the difficulties they face on a daily basis. The story of the Palestinians in Lebanon is controversial and contested – it involves not just the Lebanese and the Palestinians but also the Israelis, the Syrians and, of course, the international community. It involves conflicting accounts and views of history, the Lebanese Civil War (1975 –1990), the rights of refugees, the right to return to their homes and, ultimately, the overall situation of the Palestinian and Jewish peoples. Biladi is offered as one contribution to engaging with some of these issues and as part of a broader consideration of a human rights understanding of such issues. Biladi proposes general activities for using the photos to explore the issues dealt with. The activities are useful in training settings for generating individual and group discussion and cooperation. To acknowledge and highlight the suffering of many families in Sabra and Shatila as a result of the massacre.